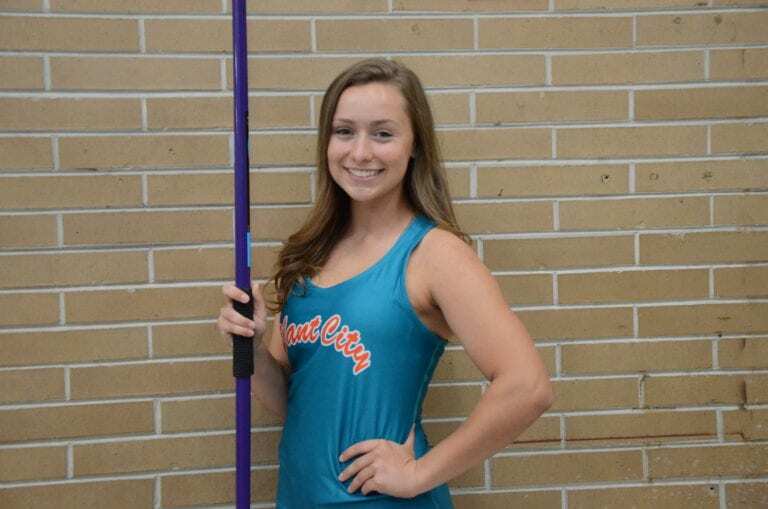 The PCHS senior has the second-ranked javelin throw distance in the state. Katherine Ruppert is new to the track and field scene, having just started in her senior year at coach Sara Tooman’s urging. The senior has learned she’s pretty good at it, though: Ruppert’s final throw for 34.5 meters at the March 15 Jack Rice Invitational (almost twice the distance of the event’s runner-up) has her ranked second in the state. Tell me about that throw. When I first went out there, my previous record was around 25 meters and at first I was only aiming for 30 meters to even get in the top eight for states. Then on my very last throw, I kept technique in mind, strength and power and posture in mind. I put all my strength and speed into it… my coaches helped me and it was just amazing. A great experience. How far is the gap between you and the first-place thrower? I think it’s around three feet. I threw 115 feet and she threw about 118 feet. I’m, like, a stride away. What’s the key for making big throws like that? Keeping your technique in mind, but not overthinking it. The one thing I tell myself is, “Just do it.” Sometimes I overcomplicate things. How long have you been throwing for? Very recently. It just became legal to start it, so I’ve only been doing it for a short amount of time. When I first started track I didn’t think I would ever do something like javelin. I started with hurdles and now I’m completely focused on javelin. It’s such an amazing sport I barely even knew about, and now I’m second in the state. What made you interested in even trying javelin once it became legal? My coaches were like, “You’re going to be doing javelin. We’re going to try you out in that.” I didn’t learn any technique and I was throwing with the boys’ javelin. They saw I was throwing as far as the boys and that I had so much power with it. It was kind of an exhilarating experience, I guess. Something really fun to work with. Now I love it. I’m just glad I have really great coaches. How long have you been doing track and field with PCHS? This year. This is my first year of doing track in my whole life. I wasn’t even going to try out for track but my volleyball coach, coach Tooman, she encouraged me to do so. So your coaches are pretty accurate with these hunches they have about you. And I love sports, so I figured, “Why not?” I’ve played every sport you could think of. Volleyball has been my favorite but javelin is slowly progressing. I think it’s a sport I want to continue on with in college and not just stop here in high school. Right now I’m planning on getting my prerequisites done at HCC and then transferring to a university. Most likely USF. But if any colleges offer me any scholarships, I am open-minded. I want to major in computer science. I’m not sure what exactly I’d minor in, but it’s something in business.